A couple of weeks ago, I was taking inventory in our fridge and I realized there were a bunch of prepared, fresh veggies that needed to be used up in there. I had a container of leftover, cubed butternut squash, a sliced zucchini, half a bag of baby spinach, a red bell pepper and some chopped, sweet onion that needed some attention. So, what was I to do with all those veggies?! Initially, I thought about throwing everything together on a sheet pan with some chicken pieces (totally digging the sheet pan dinners lately!) and some spices to roast it all. 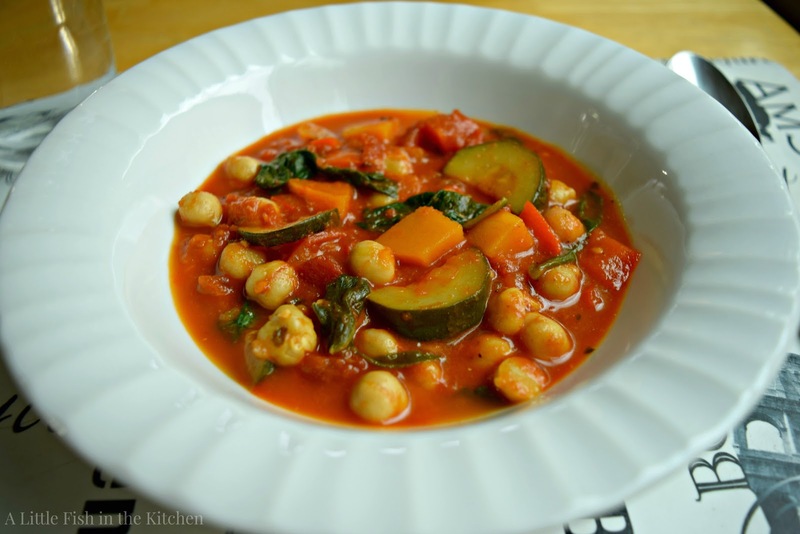 But, before committing to the oven, I decided to take a quick look in the pantry, and I immediately saw two cans each of tomatoes and chickpeas... right then I knew I had to make a meatless stew! I mean, isn't the answer to a dinner dilemma always stew?! Well, in my opinion, you can't go wrong with a good, hearty pot of stew and this veggie-loaded recipe is so satisfying that I'm certain that even the most carnivorous skeptics won't miss the meat. Trust me, my barbecue-loving husband had his doubts about this meatless supper (insert moaning and groaning here), but he was "stuffed" after just one bowl! The first time I made this soup, I used a container of vegetable broth I had in my pantry, but the second time I used chicken broth and we definitely enjoyed it both ways. 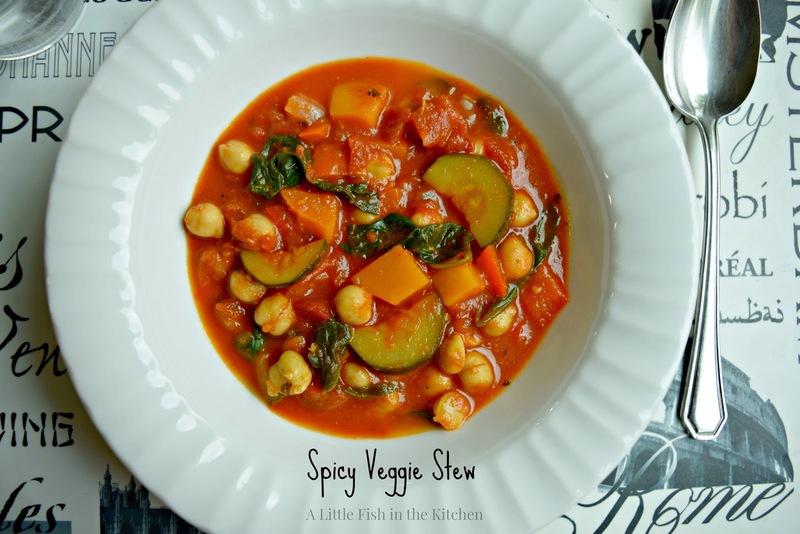 This spicy veggie stew is the result of one of my more successful "kitchen sink" moments...a.k.a. a cooking experiment that worked out well (believe me, they don't always go my way!) and I'm always happy to share pictures of family dinners we've really enjoyed on my social media feeds. I actually posted a picture of the first batch of this stew on my Instagram feed back in February and I was so excited to receive a couple of messages asking for the recipe! Thank you so much to those of you who contacted me, I really appreciated hearing from you! This veggie-loaded stew is a healthy, flavorful and satisfying main meal. It's terrific by itself or paired up with some fresh, buttered bread or crunchy saltine crackers. Heat olive oil in a large Dutch oven, and add onions, garlic, both squashes and the bell pepper to the pot. Add a few dashes of salt and saute the veggies for about 5 minutes. Add the spices and herbs to the vegetables and stir. Pour in the crushed tomatoes, diced tomatoes and broth. Bring pot to a boil and then reduce heat to a simmer. Simmer, stirring occasionally, for 25-30 minutes or until veggies are tender. Add in the chickpeas, stir and allow to simmer for 5-10 minutes more. Adjust the seasoning as desired at this time. Turn off the heat and fold in the fresh spinach until wilted. It looks almost like a veggie curry I had a while ago. Healthy and yum, Marcelle. Hi Marcelle, I know the sigh well. My carnivorous loving husband does the same. This stew looks amazing, I know both my husband and I would love this. while the sheet pan dinner woul have been great, it's most definitely stew weather right now! great way to clean out the fridge! Great flavors and color! This is perfect for any season, Marcelle. This looks terrific! So pretty, and I'll bet so flavorful. 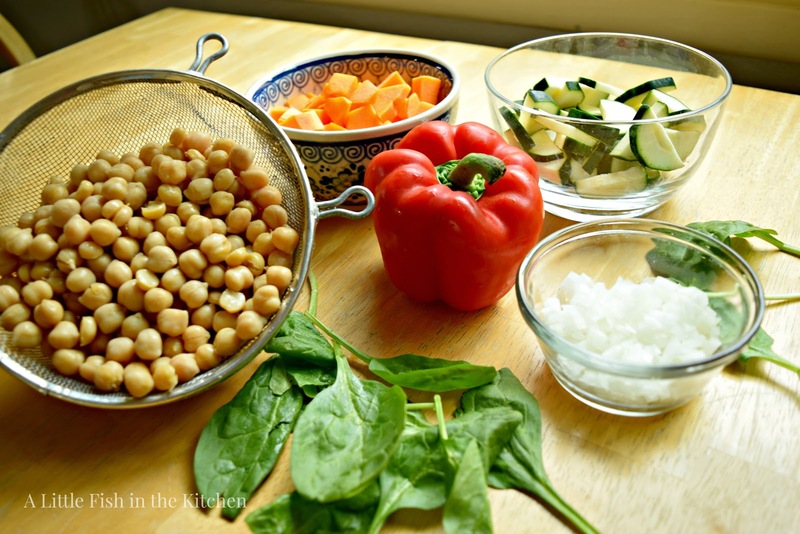 Love veggie dishes like this -- I made a curry chickpea soup with mustard greens last night for dinner. Just fun to play in the kitchen, isn't it? Particularly when you come up with something as great as this dish -- thanks so much. Yummy! I love veggie stew meals. Looks amazing and so happy you shared at Dishing it and Digging it link party.